before i start i have tried 2 do all the research and have a general idea of my setup but would like 2 be sure any input would be greatly appreciated , ok guys n girls here we go , im in the process off buying an 87-93 mustang housing from a gt i already have 33 spline strange axles stock stang length , strange 33 spline spool , strange 513 gears ,and washer n bearing kit . i have read the 8.8 is very close 2 our rear as far as length ,my thoughts were 2 weld the brackets 2 the 8.8 install all the goodies and go play ,brakes will be aerospace drag drilled kit ,does any 1 have this set up as far as stock stang housing length ?most welding will be done in a professional shop. PSHH! PSHH! HEAR ME NOW? Here's a good place to get all the knowledge you would want with a 8.8 swap. http://grannysspeedshop.com/ is pretty much the authority on LRA swaps/convertions for all generations so you might find something there about the width. Two doritos, on a stick..
Hey, I have an 8.8 on the back of my 79. I made my own 4 link suspension with a bunch of pipe and some weld in heims and then made a panhard bar and the neccessary attachments. As far as tires i am running a 10.5 inch wide tire in the back and man it is a squeeze. I don't think i would recomend running more than a 10. I have 300lb springs and when the car drives again I am hoping not to have to much travel because there is maybe an 1/8 inch clearence on either side of the tire. 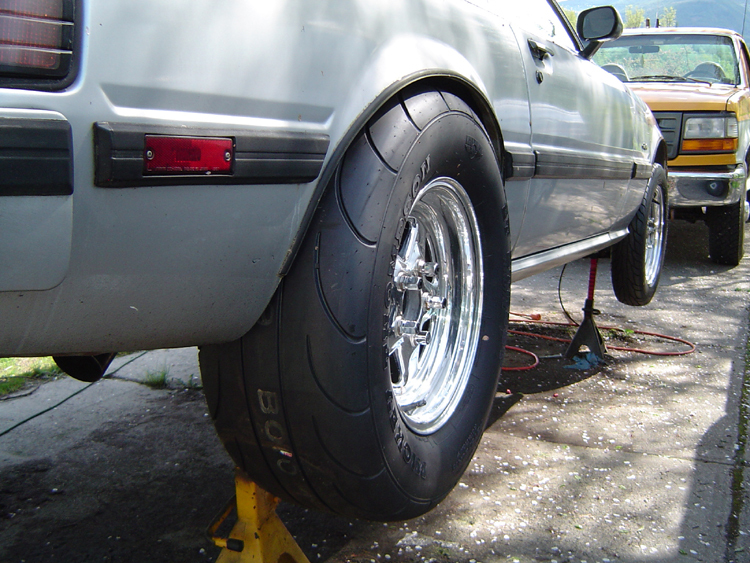 You were asking if a 26 inch diameter tire by 8.5 inches wide would be too wide. Bad83 stated that he is running 275/60/15 tires which are much bigger than what you have asked about. 27.99 diameter by 10.8 wide. I got a raw shortened rear end from grannysspeedshop because he was selling it in his clearance section dirt cheap. Through the use of 2 inch wheel spacers, I have effectively brought the rear end back to stock length. The springs I have used lower the car two inches and as such the control arm lengths have been adjusted slightly (still playing with them..it will be tough to tell until the car drives). 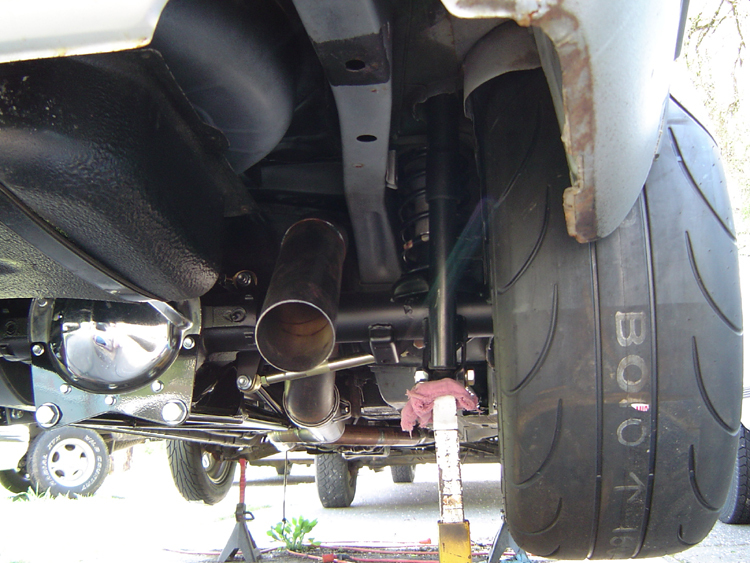 Also, my panhard bar mount goes exactly where the exhaust goes over the axel in these grannyspeed shop photos, so I have run a dual 2.5 inch side exhaust. 94 R2 lost in the garage for 11 years what to do?? Squeak when turning car off? Quick Reply: 8.8 and slicks ?? ?